This is of course some crew action aboard the 88 metre Maltese Falcon. She has been available for charter in the Med this summer for 350,000 euros per week, and took part in the Perini Navi superyacht regatta in stunning Porto Cervo, Sardinia in late August . More to come on my blog, as I have a bunch of pics collected over the years that I would love to share…Watch out in future for YachtMedia’s Pic of the Week!! This is a fantastic picture. 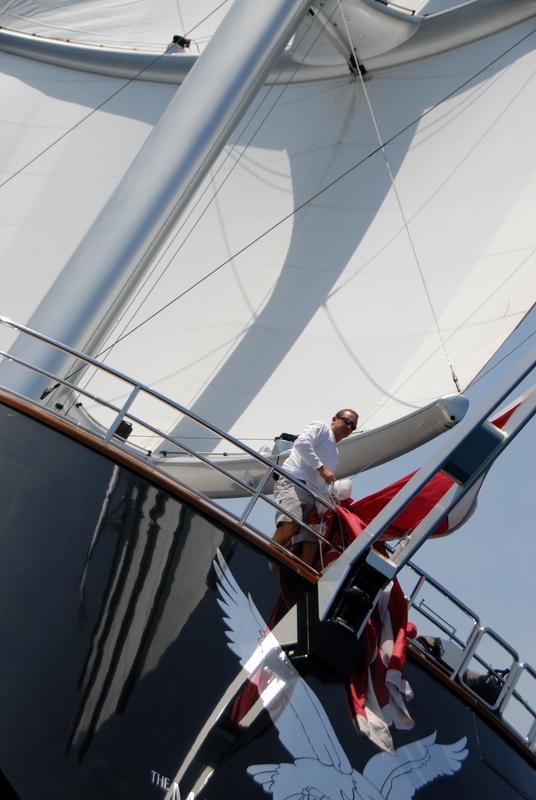 The maltese Falcon has such a presence, I found she was definitely a hot topic at the Monaco Yacht Show this year. Hiya, I missed MYS for the first time for quite a few years. But I hear it was as good as usual. The Falcon was out in the bay kast year, and I agree with you, her presence always makes a difference!